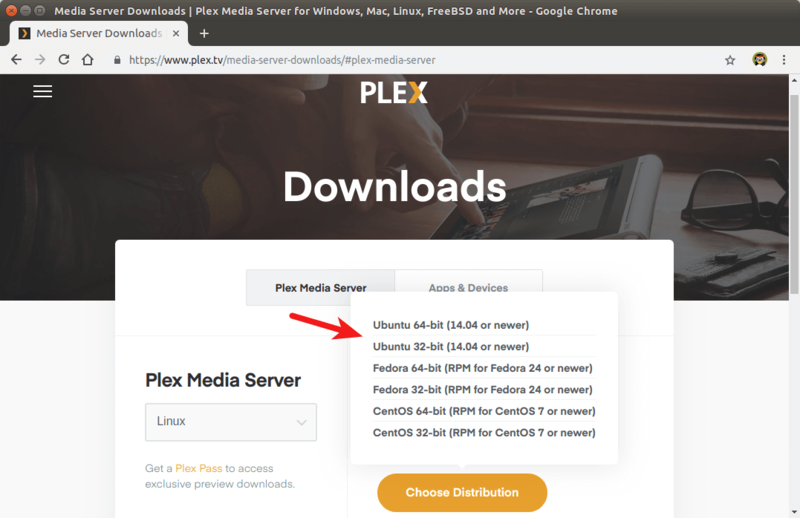 This tutorial will be showing you how to install Plex media server on Ubuntu 18.04 LTS server/desktop. 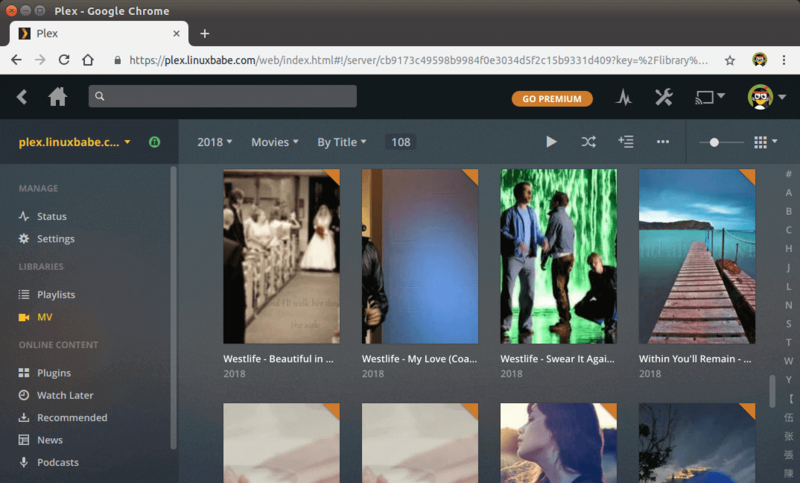 Plex is a free piece of software that allows you to organize your movies, TV shows, music and photos in one beautiful interface and stream those media files on your PC, tablet, phone, TV, Roku, etc on the network or over the Internet. 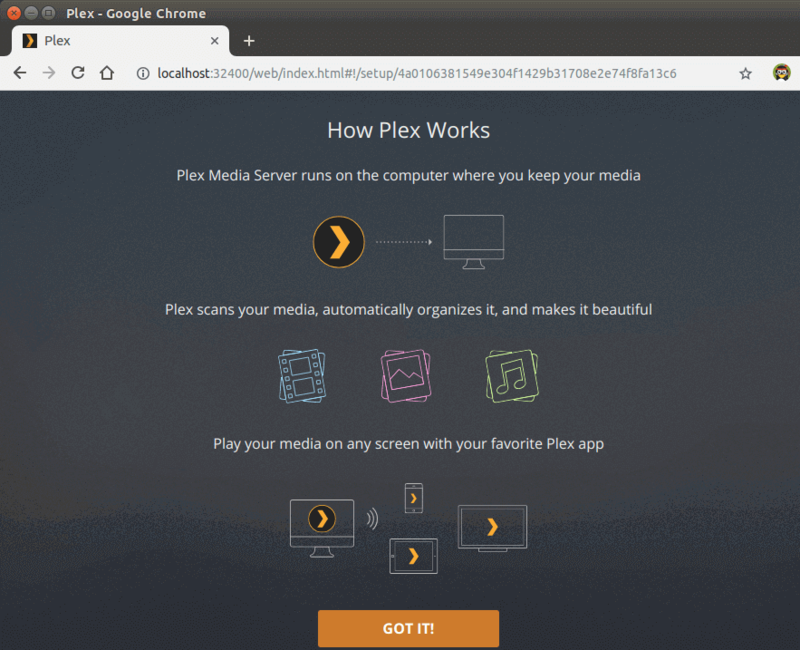 Plex can be installed on Linux, FreeBSD, MacOS, Windows and various NAS systems. 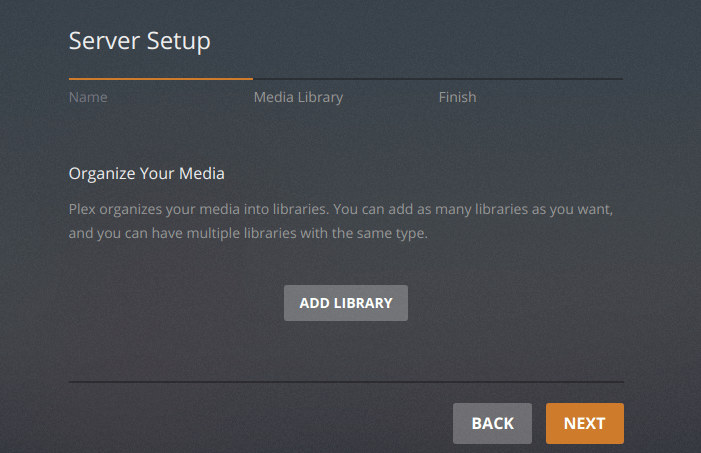 First, go to Plex server download page, select Linux and choose Ubuntu 14.04 or newer. If you are going to install Plex on a headless Ubuntu 18.04 server, then you can go to your browser’s download history, then copy the Plex download link and use wget to download Plex from command line like below. Once the Plex deb package is downloaded, cd to the download directory. For example, my Plex is downloaded to the Downloads directory under Home, so I run the following command. The tilde (~) represents home directory. On Debian based Linux distros (Ubuntu, Linux Mint, etc), dpkg is the standard command line tool to install deb packages. So run the following command to install the Plex deb package. You can press the Tab key, which will autocomplete the filename. By enabling the official Plex repo, you can update Plex on Ubuntu with apt package manager. The Plex deb package ships with a source list file. To see a list of files installed from a package, run dpkg with -L flag. Open this file with the following command. By default, its content is commented out. Uncomment the last line. (Remove the beginning # symbol). Then save and close the file. To save a file in Nano text editor, press Ctrl+O, the press Enter to confirm. To exit, press Ctrl+X. 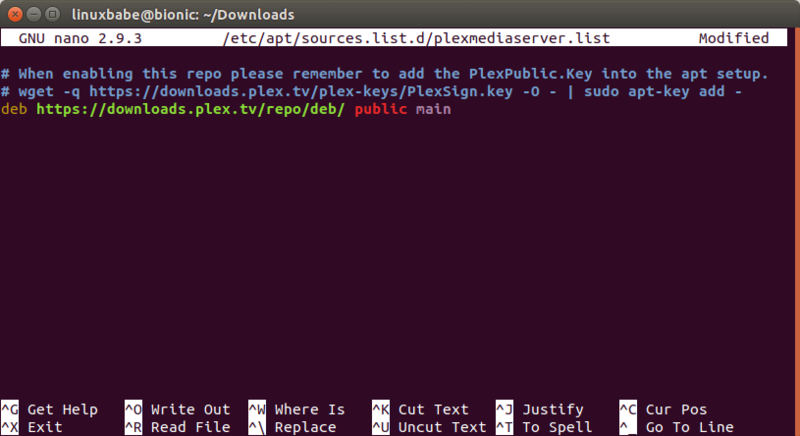 After that, run the following command to import Plex public key to apt package manager. Now update software repository index. If you see the following message. You can safely ignore it because it’s a warning, not an error. Plex repository is working fine for Ubuntu 16.04. You will see this message if you use Ubuntu 18.04. You need to wait for Plex developers to fix this problem. If you don’t like to see this message, then disable the Plex repository. You can re-enable this repo when a new version of Plex comes out. You can see that Plex media server is listening on 0.0.0.0:32400 and 127.0.0.1:32401. The web-based management interface is available at port 32400. The first time you configure Plex, you must visit Plex via 127.0.0.1:32400/web or localhost:32400/web. 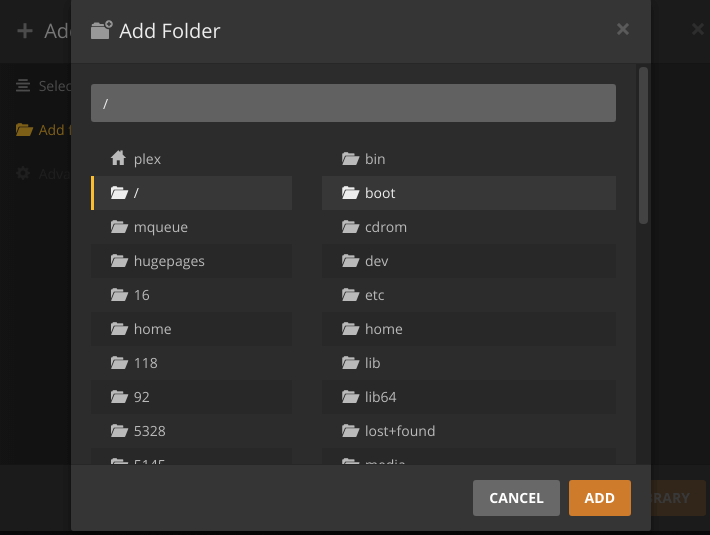 If you installed Plex on your Ubuntu 18.04 desktop, then you can search Plex Media Manager in your application menu. 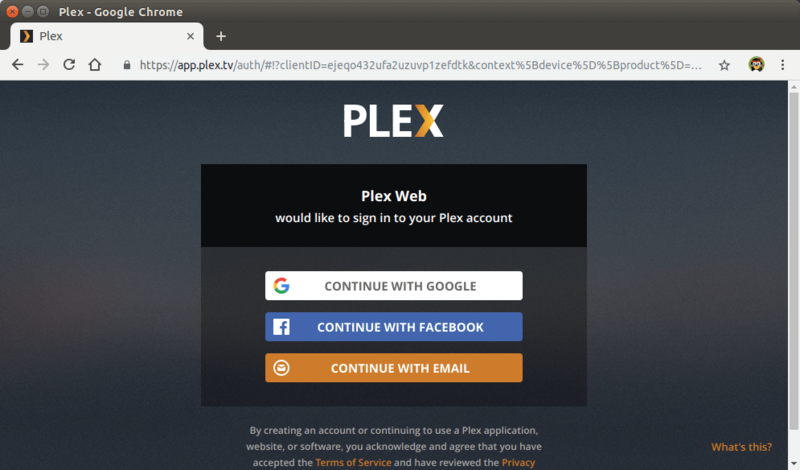 It will take you to Plex web interface, which in turn will take you to https://app.plex.tv because you need to sign in with a plex.tv account. Note that if Plex is installed on a remote Ubuntu 18.04 server, you need to set up a SSH tunnel by executing the following command on your local computer. Replace 12.34.56.78 with the IP address of the remote Ubuntu server. Then you can access Plex web interface via the following URL. This HTTP request will be redirected to http://localhost:32400/web on the remote server through SSH tunnel. This SSH tunnel is only needed for the initial setup. After the initial setup, you can access Plex web interface via server-ip-address:32400. Replace server-ip-address with your real server IP address. Once signed in, you will be redirected to localhost:32400 to do the initial setup. On the next screen, enter a name for your Plex server. Make sure Allow me to access my media outside my home is checked. Then click Next. Now you can add libraries. Click Add Library button. Select a library type, then click browse for media folder button to add your media folders. You may also need to assign permission on individual media directories like below. It can be tempting to add the recursive flag (-R), which gives plex read and execute permission on every file and sub-directory on the drive. If your external hard drive is only used for storing media files, then you can do so, but if you have sensitive files on the external hard drive, don’t do it. Once you finish adding your media folders, click Next and then click Done. You can always add more libraries later. If you made a mistake in the initial setup, you can delete the Preferences.xml file and start it over. Now visit localhost:32400/web again. Plex will tell you there’s an unclaimed server. Click claim it now. If you prefer to use a domain name rather than typing http://localhost:32400 to access your Plex media server, then you need to set up a reverse proxy. We can use Nginx for this purpose. Install Nginx from the default Ubuntu software repository. Then create a server block file for Plex. Save and close this file. Then test Nginx configuration. If the test is successful, reload Nginx for the change to take effect. Now you can access Plex media server via plex.example.com. If you prefer Apache over Nginx, then install Apache web server by using the following command. To use Apache as a reverse proxy, we need to enable the proxy modules and the header module. Then create a virtual host file for Plex. Put the following configurations into the file. Replace plex.example.com with your actual domain name. Don’t forget to create DNS A record for this sub-domain. 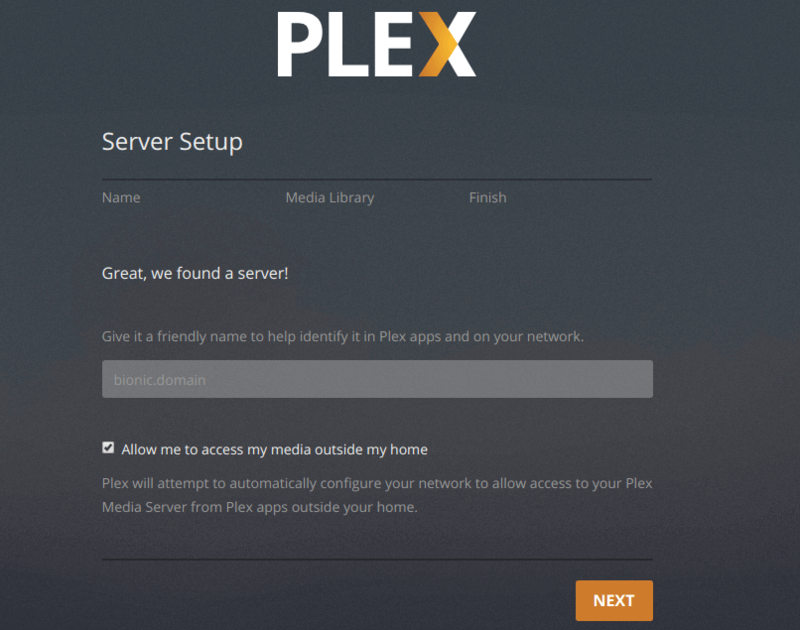 Now you can access Plex media server using the domain name. To encrypt the HTTP traffic when you visit Plex server from outside, we can enable HTTPS by installing a free TLS certificate issued from Let’s Encrypt. Install Let’s Encrypt client (certbot) on Ubuntu 18.04. Python3-certbot-nginx is the Nginx plugin and python3-certbot-apache is the Apache plugin. If you use Nginx, then run the following command to obtain and install TLS certificate. And you can access Plex web interface via HTTPS. When a new version of Plex media server comes out, you can upgrade it by executing the following commands. Thanks for this nice guide, it works. Just a question, I access it from Raspbian (on Rapsberry). Is there a way to avoid to open the SSH tunnel each time before accessing it? I mean a way to make it permanent. The SSH tunnel is only needed for the initial setup. After the initial setup, you can access Plex web interface via server-ip-address:32400. Replace server-ip-address with your real server IP address. One of the most thorough guides I have seen for Plex setup. The SSH tunnel was really helpful for me, as I installed on a headless Ubuntu 18.04 setup. command from “Git for Windows” (search on Google), and enabling the option to use Linux CLI tools in the Windows CMD prompt during setup. If I remember correctly, Windows 10 PowerShell has a builtin ssh command. For windows 7 and 8 users, install Git for Windows or use Putty. Just wondering would it possible for you to do a tutorial on installing Plex Requests on Ubuntu Server 16.04? Super easy to follow and get up and running, thank you! I was afraid switching from Windows 7 as a media server to Ubuntu was going to be hard, several of your guides now have got me running smoothly! Got a question on setfacl. I’m using a QNAP Nas server for ALL the files that my Plex is using. What permissions in file sharing do I need? Plex needs read and execute permissions on your media files. Just run the setfacl command, replace /media/linuxbabe/ with the mount directory of your NAS. Which is why Im confused. The NAS controls who has access to the files, not the outside unit like the Plex. I don’t have a QNAP, so can’t help with this.
. Whether I use the password for the remote linux or the local linux, I continue to get permission denied. I’m very confused by this step. For the initial command, I am using the correct IP address for the remote machine as verified by ifconfig. I realized that by adding the user to the command, it works. And see if Plex is listening on port 32400. I couldn’t access a different server I had installed but figured out I needed to allow the connection through ufw. I’ve ensured I have done that for Plex too. Thanks for this! Plex was one of the last pieces of switching my server from Windows 10 to Linux. It’s been challenging, but the reduced footprint on my ageing HP Gen 7 Microserver has been greatly appreciated! Whats the deal with updating? PMS is telling me there is a new version, so i did sudo apt update. I get the “Conflicting distribution….” error, as expected, but also NO new available version to update. So how do i update PMS to the recent new version? The new version isn’t in the repository yet. If you can’t wait, you need to download the deb package from Plex download page and install it with dpkg, just like when you first install it. Then restart Plex. After save your configuration ! After add proxy configuration 127.0.0.1 SOCKS 5 with 1080 port in your browser or windows proxy for exemple. Try to connect to 127.0.0.1:32400 or localhost:32401 !